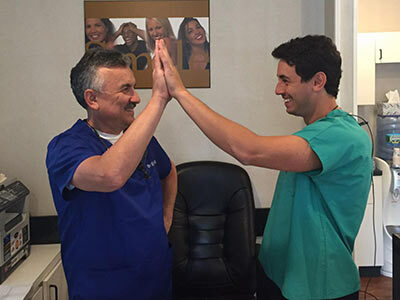 Dr Alexander Khabensky DDS of Family Cosmetic & Implants Dentistry of Brooklyn is an award winning cosmetic dentist, dentistry expert and contributor to a prominent media outlets including HuffPost, Stanford. Top Brooklyn dentist Dr Alexander Khabensky DDS provides a full range of dental procedures to treat conditions that affect your gum and facial bones. 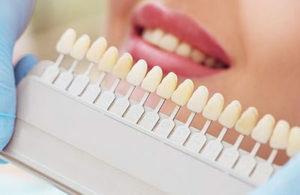 Best rated cosmetic dentists in Brooklyn Alex and Igor Khabensky of Family Cosmetic & Implants Dentistry of Brooklyn are using the very latest cosmetic dental materials, best and proven techniques. We offer the newest and the most advanced dental implant components available on the market today. 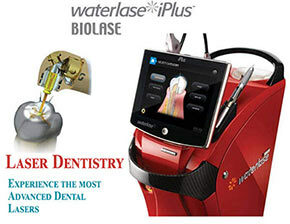 Our state of the art cosmetic dental clinic and pediatric dental center in Brooklyn equipped with the most advanced equipment available in USA including latest, top performance lasers & high precision microscopes. We use only the best quality medical grade titanium or titanium alloy for dental implants. We work with top dental laboratories in Brooklyn to provide you with the most accurate and natural looking solutions. I would give more than five stars if I could. I have been coming here for a couple of years now and I could honestly say switching to Family Cosmetic & Implants Dentistry of Brooklyn was the absolute best decision I could have ever made. Not only have I done dental work, but also have straightened my teeth with their clear aligners and am ecstatic with the best results!! I have always had major anxiety when going to the Brooklyn dentist and a fear of needles, but that went away after my first appointment! The Doctor made me feel so relaxed, took my fears and uneasy feelings seriously, and actually listened to my concerns. He even offered me a pillow so I can lay comfortably during my appointment! I have never experienced pain during any appointment for any reason. The work they do there is beyond fantastic and I would recommend everyone I know. Forgot the horror stories you’ve had to endure before with other Brooklyn dentists, and go where you’re actually treated like a human being! Thank you a million times to the best dentists Dr Igor and Alex Khabensky for their superb work. I am so proud to show off my beautiful smile!!! When I finally saved up enough money I began to search for a best porcelain veneer dentist Brooklyn. I finally found the one I thought was right when I discovered Brooklyn Cosmetic Dentistry. I wanted to have my front teeth veneered and this place specialized in that type of work. I made an appointment and had the procedure done. I was very happy with everything about the dentist, staff and office. My smile is one I can be proud of. I want to emphasize few things that are unusual at this top rated office. There are many good dentists in Brooklyn, however there are few things that make them stick out from many. 1. Dr. A. Khabensky has general medical background prior to become dentist. It is not unusual for him to find the real problem even if it seems like a simple tooth ache. 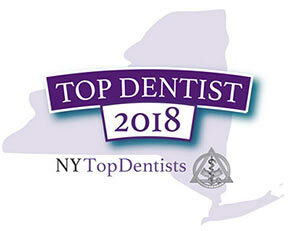 He is top rated dentist in Brooklyn and has more than 30 years of experience. That might save your life! 2. Both doctors have outstanding skills, their work looks like a million bucks. 3. Dr. I. Khabensky is a true talent of dental art not to mention special training in dental implantology, pediatric and cosmetic dentistry. The bottom line – look where doctors themselves go for help. I came to Dr. Igor Khabensky today for a consultation. I am highly pleased with my visit. I experienced great professionalism from the Brooklyn dentist and the staff. Before he made his final decision, he performed a thorough examination and spent a lot of time explaining and showing me the prognosis of my problem. He is truly passionate about his patients and work. Thank you so much Dr. Igor Khabensky for all your attention and help! I highly recommend this Brooklyn dentist! Our entire family visits Quentin Smile in Brooklyn NY for regular checkups. I have also seen the top gingivitis dentist in Brooklyn for an evaluation that was fortunately negative. It was recommend that i have one dental implant done followed by four veneers. I am planning to have it done soon. We all feel very comfortable with Dr. Khabensky and the staff at Family Cosmetic & Implants Dentistry of Brooklyn because they make us feel at ease and there is never any discomfort. I found a cosmetic dentist at Quentin Smile Dental Services to apply veneers to my teeth at a reasonable out pocket cost. My insurance would not pay for porcelain veneers dentist so the Brooklyn dental office set me up with a plan that worked. Now I have the smile I always wanted. Quentin Smile Dental in Brooklyn is where I go for a totally painless dentist. I discovered the office when I had an emergency and they were nice enough to take me right away. Since then I have had dental implants that I had put off for years out of fear. Family Cosmetic & Implants Dentistry of Brooklyn removed all my fear. Always love to give credit to good people, I hate going to the dentist usually, the last Brooklyn office I went to was comfortable but moved and wanted someone closer to my house, mostly because I’m lazy. Today I saw Dr Igor Khabensky and was an excellent visit. Very nice guy (and the entire office staff was great), the dental office was super clean and modern. Have nothing but good things to say about them. Both Dr. Igor and Alex Khabensky are attentive and have great bed side manner. I couldn’t be happier with my experience in their dental office. I would highly recommend anyone looking for a great dental clinic or best dentist to visit their brooklyn office. Do you have questions for the best dentists in Brooklyn? 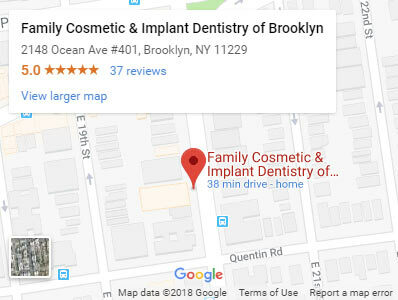 Would you like to schedule an appointment with the top Brooklyn dental specialists Alex and Igor Khabensky of Family Cosmetic & Implants Dentistry of Brooklyn? Please contact our Brooklyn dental clinic.